A group of astronomers who announced in March that they had detected space-time disturbances — gravity waves — from the beginning of the Big Bang repeated that claim Thursday but conceded that dust from the Milky Way galaxy might have interfered with their observations. The original announcement, apparently heralding what they said was “a new era” in cosmology, astounded and exhilarated scientists around the world. At a splashy news conference on March 17 at the Harvard-Smithsonian Center for Astrophysics in Cambridge, Mass., the talk quickly turned to multiple universes and Nobel Prizes. But even as reporters and scientists were gathering there, others convened on Facebook and elsewhere to begin picking apart the findings. What ensued was a rare example of the scientific process — sharp elbows, egos and all — that has played out over the last three months. If indeed true, the detection of those gravity waves would confirm a theory that the universe began with a violent outward anti-gravitational swoosh known as inflation — a notion that would explain the uniformity of the heavens, among other mysteries, and put physicists in touch with quantum forces that prevailed when the universe was only a trillionth of a trillionth of a second old. The idea once seemed like science fiction, but the astronomers’ findings put it almost tangibly in reach. As everyone involved said at the time, however, the results needed to be confirmed; it was far too soon to book travel to those other universes. But the team’s response to this claim is unequivocal: “We’ve done no such thing,” says principal investigator John Kovac at Harvard University. The validity of the discovery won’t be known until another group either supports or opposes their finding, which could happen later this year. In a series of five lectures I review inflationary cosmology. I begin with a description of the initial conditions problems of the Friedmann-Robertson-Walker (FRW) cosmology and then explain how inflation, an early period of accelerated expansion, solves these problems. Next, I describe how inflation transforms microscopic quantum fluctuations into macroscopic seeds for cosmological structure formation. I present in full detail the famous calculation for the primordial spectra of scalar and tensor fluctuations. I then define the inverse problem of extracting information on the inflationary era from observations of cosmic microwave background fluctuations. The current observational evidence for inflation and opportunities for future tests of inflation are discussed. Finally, I review the challenge of relating inflation to fundamental physics by giving an account of inflation in string theory. Have you detected B-modes from inflation? We have detected B-mode polarization at precisely the angular scales where the inflationary signal is expected to peak with very high significance (> 5 sigma). We have extensively studied possible contamination from instrumental effects and feel confident we can limit them to much smaller than the observed signal. Inflationary gravitational waves appear to be by far the most likely explanation for the signal we see. Couldn’t it just be galactic emission or polarized dust? The data disfavor this. The best current models of polarized galactic emission in our observing region show it to be much fainter than the signal we see. Also, there is little evidence for correlation between our B-mode maps and the predicted pattern from the galaxy. Finally, within our own data, the “color” of the B-modes found by comparing different frequencies is consistent with CMB but disfavors galactic contamination. Have you detected a gravitational wave? The frequency of the cosmic gravitational waves is very low, so we are not able to follow the temporal modulation. However, we are indeed directly observing a snapshot of gravitational waves through their imprints on matter and radiation over space. Ordinary density perturbations cannot create the pattern we observe. The presence of a water wave can be detected by feeling its up-and-down motion or by taking a picture of it. We are doing the latter. What is B-mode polarization and how is it generated by inflation? Measuring the polarization of the Cosmic Microwave Background at different points on the sky determines a direction and polarized intensity (the polarized intensity of the CMB is less than 1/1,000,000 its total brightness). This can be visualized as a map of little line segments at every spot on the sky, the patterns of which we analyze. B-mode polarization is essentially the swirly part of that pattern (known mathematically as the ‘curl’). For the density fluctuations that generate most of the polarization of the CMB this part of the primordial pattern is exactly zero. [This is because density flows in the early universe go into or out of dense regions, and the polarization lines up with these flows in a way that doesn’t swirl, producing only so-called E-mode polarization. To generate a B-mode pattern in the early universe you need gravitational waves. ]Inflation magnifies quantum fluctuations, which exist even in vacuum. The quantum fluctuations in the inflation field itself (“inflaton”) become the density fluctuations seen in the CMB and at much later times in galaxy distributions. During inflation, the quantum fluctuations in gravity (“graviton”) become long wavelength gravitational waves that produced the B-mode we see. Wasn’t B-mode polarization detected last year? Yes – but a different kind. Last summer the 10-meter South Pole Telescope announced the first evidence for B-mode polarization in the CMB on arcminute scales which arises from thelensing, or bending of light, by gravitational attraction of structures formed in the relatively recent universe. Recently a second telescope, Polarbear, has also detected this effect. Our data sees this lensing effect too, but what is critical is that we see strong B-mode polarization at the much larger angular scales–2 to 4 degrees on the sky–where lensing is a tiny effect but where inflationary gravitational waves are expected to peak. Didn’t Planck find that r < 0.11? Do your experiments disagree? Our measurements don’t disagree. Constraints on the gravitational-wave background level r reported from Planck and previous experiments are not from measurements of B-mode polarization. Instead, they come from the CMB temperature measurements which show surprisingly low power at the largest scales, implying little room for an additional contribution from tensors in the context of the simplest models. B-mode measurements like ours aim to directly measure the inflationary gravitational-wave pattern itself at the degree angular scales where it should peak. 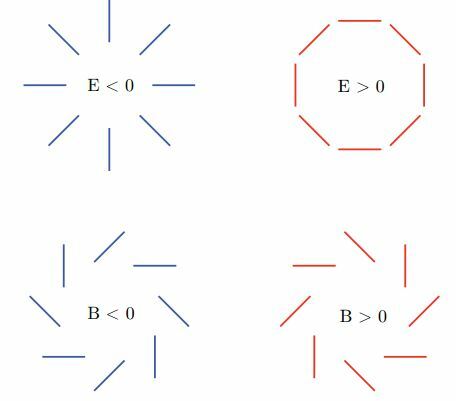 The tension between the high level of B-mode polarization we see and the apparent low power at large scales may be a statistical fluke, but many possible extensions to the simplest model could also relieve this apparent tension. Are you claiming you’ve detected running of the spectral index? No. Running is a commonly-studied modification to the simplest Lambda Cold Dark Matter (LCDM) model in which the slope of primordial spectrum is allowed to change from large to small scales, but it is only one of the possible model extensions that could relieve tension between a high value of r and the low large-scale temperature spectrum. We only choose it as an example because it is simple and familiar from analyses by Planck and other teams. We anticipate that cosmologists will think broadly about possible parameter shifts or model extensions. Will your data/maps be made public? Yes. The papers describing the results we present today are available for download on our webpage right now (and will be on arXiv tomorrow morning). The B-mode results and the information needed to do cosmological analyses with them are available for download now. The maps we’ve shown, including the high signal-to-noise images of B-mode polarization, will eventually also be released in digital form with the information needed to re-analyze and compare them to independent observations (though this will take us a while). Water vapor in the atmosphere absorbs microwaves, making detailed studies of the CMB impossible from most places on earth. The South Pole is near the middle of the Antarctic plateau, the driest environment on the planet. At an effective altitude of over 10,000 feet (~3000 meters), stable weather patterns and winter temperatures averaging -72F (-58C), the South Pole is the closest a ground-based telescope can get to being in space. The patch of sky we study is visible from the South Pole continuously, 24h each day for the whole year. The National Science Foundation’s US Antarctic Program, which operates the South Pole Station, provides excellent infrastructure, communications, and support for the small team needed to run our telescopes, including our winterover scientists Steffen Richter and Robert Schwarz. Who funds BICEP2 / this project? BICEP2 is funded by the National Science Foundation. 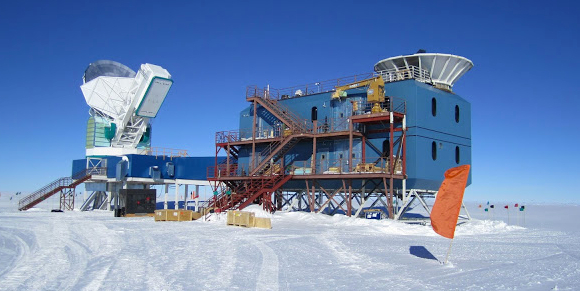 Like the other telescopes in our BICEP and Keck Array series of experiments, NSF has supported its construction and operation, and also runs the South Pole Station where all our telescopes observe. The Keck Foundation has also contributed major funding for construction of our telescopes. NASA, JPL, and the Moore Foundation have generously supported the development of the ultra-sensitive detector array technology which make these measurements possible. John Kovac has led the BICEP2 experiment. Clem Pryke has led the analysis that produced today’s results. Jamie Bock contributed the optical concept for the experiment and developed the detector array technology. Chao-Lin Kuo designed the polarization sensitive detectors used in BICEP2 and is leading the next major telescope in this series, BICEP3. BICEP2 is the second stage of a coordinated program, the BICEP and Keck Array series of experiments, developed for the South Pole. This coordinated program has a co-PI structure. The four PIs of this series are John Kovac (Harvard), Clem Pryke (UMN), Jamie Bock (Caltech/JPL), and Chao-Lin Kuo (Stanford/SLAC). All have worked together on the present result, along with talented teams of students and scientists. Other major collaborating institutions for BICEP2 include UCSD, UBC, NIST, University of Toronto, Cardiff, and CEA. What does “BICEP2” stand for? Officially, “BICEP2” is not an acronym. It’s simply a name. Although we have twelve collaborating institutions (see above) the core team working on this result has been relatively small for a major science project–a few dozen people. We’d like to particularly highlight the contribution of our dedicated graduate students Randol Aikin, Justus Brevik, Kirit Karkare, Jon Kaufman, Sarah Kernasovskiy, Chris Sheehy, Grant Teply, Jamie Tolan, and Chin Lin Wong. Our project postdocs have also included Colin Bischoff, Immanuel Buder, Jeff Filippini, Stefan Fliescher, Martin Lueker, Roger O’Brient, Walt Ogburn, Angiola Orlando, Zak Staniszewski, and Abigail Vieregg. Indeed yes, this is a highly competitive field. There are currently about a dozen ground-based and balloon-borne telescopes that are targeting the goal of measuring B-mode polarization. Many of them are described in this recent review. In addition, polarization data from ESA’s Planck satellite are eagerly anticipated. We look forward to results from these experiments which we hope will confirm and further extend the detection we report today. In the coming months our team plans to release improved data from the Keck Array, which will further test the BICEP2 detection at 150 GHz and add improved sensitivity at 95 GHz to further constrain foregrounds. By the end of this year the Planck satellite will release its polarization results. Of course we look forward to hearing results from other experiments which can test these results, and extend the frequency and angular coverage. We expect rapid progress. On a somewhat longer timescale, a detected signal at this amplitude raises exciting possibilities for studying inflation through more precise CMB polarization measurements over the entire sky which will spur the community to develop a new generation of ground-based and space-borne experiments.